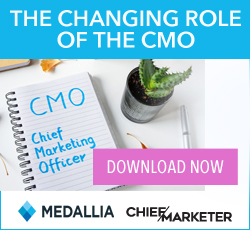 At the Cannes Lions International Festival of Creativity last month, Unilever CMO Keith Weed made waves by proclaiming his CPG giant would no longer work with social influencers who inflate the cost of their partnerships by purchasing fake followers. Marketers are beyond tired of wasting budget on bots with cold, personless profiles when they could be using those dollars to engage warm bodies with credit cards. Exactly how big of a problem are fake followers? 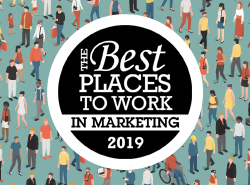 Points North Group, an influencer marketing analytics specialist, recently released second-quarter statistics that offer answers for Instagram after examining the platform’s sponsored posts by influencers with at least 10,000 followers. The New York-based company found brands spent $150 million in the U.S. and Canada in Q2 on Instagram influencers, and 7.3 percent—or $11 million—was lost to bots. Some brands suffered much more than others. Raw Sugar Living evidently got ripped off the worst, as the skincare startup was number one on Points North Group’s Q2 chart for the most fooled brands. Forty-six percent of the followers Raw Sugar paid to interact with entailed fake accounts. 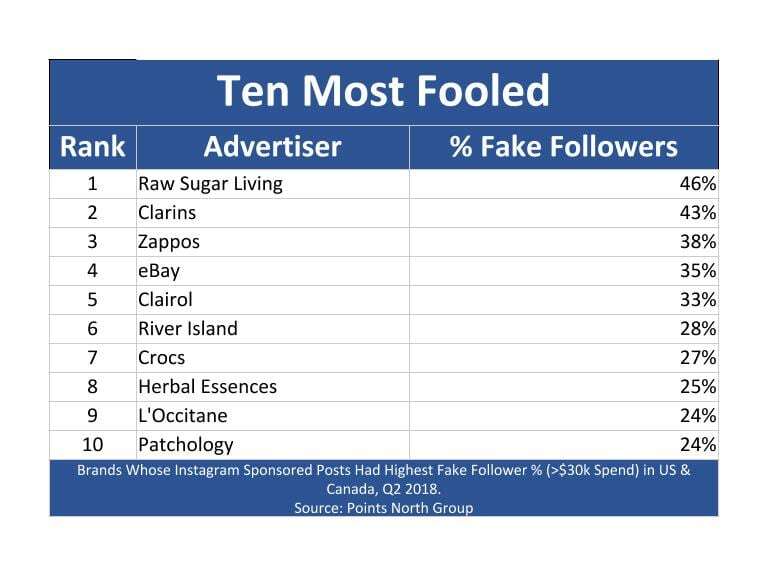 Beauty marketer Clarins (43 percent), shoes seller Zappos (38 percent), ecommerce giant eBay (35 percent) and haircare notable Clairol (33 percent) round out the first half of the top 10 most fooled. Each brand declined comment for this story. It’s inherently problematic for social media influencers to buy followers if they want to be on the level with brand partners. When followers are purchased for platforms like Instagram rather than accrued through hard-earned, post-by-post engagement, they are prone to be either non-human bots or inactive accounts that were opened by real users only to become abandoned avatars. Bought followers can also entail random people who still use their accounts but, in all likelihood, are not going to find the purchasing brand to be relevant to their interests. But how do fake followers compare to digital ad fraud as a whole? 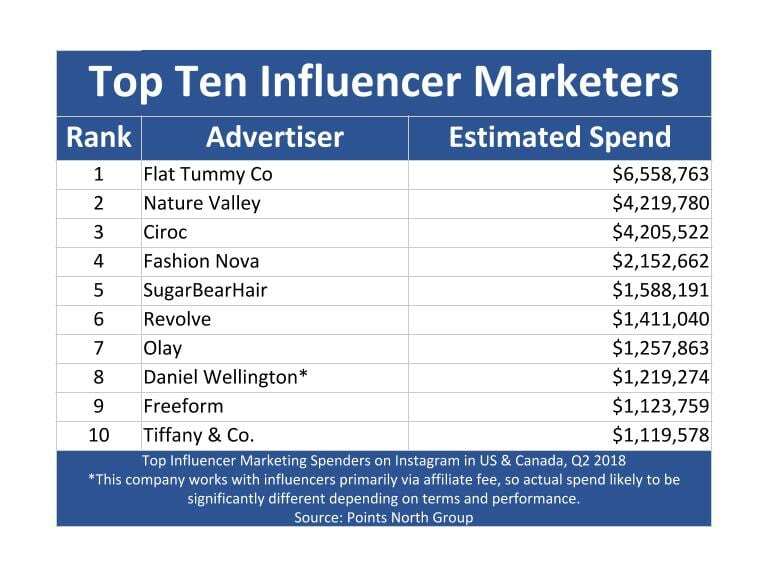 For the first time, Points North Group in Q2 estimated influencer marketing budgets across all social platforms in the U.S. and Canada, and it concluded $211 million was spent. If like with Instagram, 7.3 percent of that $211 million was wasted on fake followers, then roughly $15 million went into the bot void in Q2. Assuming those numbers remain consistent across four quarters, the 2018 total would end up around $60 million. To compare, digital ad fraud in the U.S. was expected to reach $6.5 billion. Thus, social influencer thieves are relatively small potatoes. For a marketer like Unilever’s Weed who is trying to maximize ROI, though, they’re worth chewing on. Meanwhile, Points North Group began researching social influencers during the first quarter, releasing a limited set of data in April. The company plans to make its report a quarterly event that becomes more granular. 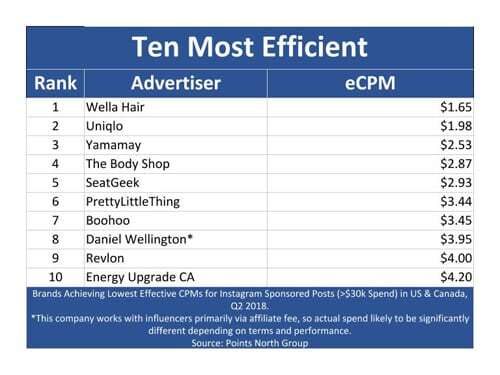 With that in mind, today, it is also releasing a top 10 list for brands that got the best cost-per-thousand (CPM) rates last quarter. Major winners include Uniqlo, The Body Shop and Revlon. Check out the full chart that entails each company’s average CPM rate for the quarter. Christopher Heine is a New York-based freelance writer and content specialist.